A diluted chlorine and detergent solution is sprayed onto all external surfaces from gutters to ground. The active ingredients kill mildew, loosen the stickiness of cobwebs and enable the removal of grease and grime. Where necessary, dusty or stubborn stain areas are brushed and or applied with degreaser or stronger chlorine solutions. Controlled pressure rinsing is then used to remove all dirt, cobwebs and grime. Unsightly wasp nests, flying fox and gecko droppings are also removed during this process. The use of mild detergents and extra rinsing of windows reduces the likelihood of any residue streaking. Our process will restore the look of your home; ideal for pre-sale, pre-paint or just a great look! Manual Hand washing where required to ensure the removal of all remaining residue, dirt and mould. Our house washing process is also ideal for the cleaning of fencing, greatly enhancing the look of your property. You'll be surprised how little extra it costs to have your fence cleaned with a house wash. Click here for a free quote. Stoned areas such as walkways, driveways and pool areas are all subject to black growth, dirt and grime build up. When this occurs these areas become unsightly and may become slippery and dangerous. 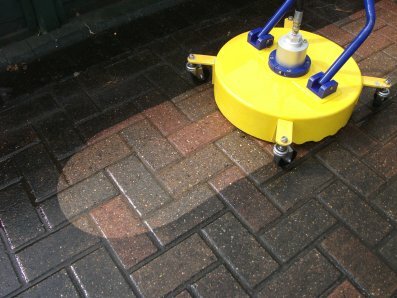 All areas are cleaned using a Rotary Cleaning appliance which ejects water at high pressure via two spinning nozzles. This is a very effective and efficient way to neatly clean these surfaces. In areas where black growth is a problem a chlorine solution is applied to the area after cleaning to help inhibit further re-growth. Enhances the look of your property and ensures safety for pedestrians. Don’t you want some free time? Do you always want to be dogged by work both on the inside and outside? Well, if you are hard up for time.